The 5-hour long workshops included interactive presentations on sustainability practices, an overview of INVEST, and small group breakout sessions that used OM INVEST criteria to perform a self-evaluation of MassDOT sustainability best practices for highway operations. 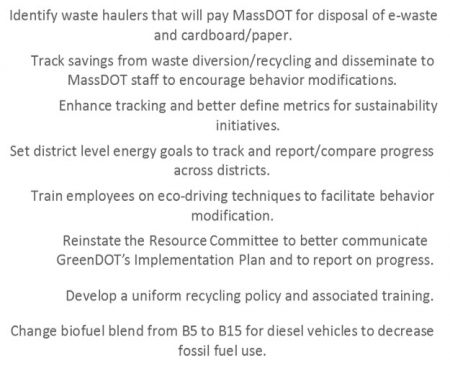 Of the fourteen INVEST OM criteria, MassDOT selected four that best aligned with MassDOT’s GreenDOT Policy and Implementation Plan. GreenDOT is a comprehensive environmental responsibility and sustainability program that positions MassDOT as a national leader in greening the state transportation system. 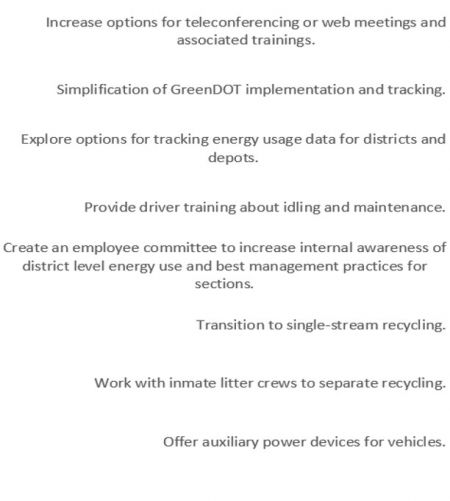 The GreenDOT Policy was adopted in 2010 and the GreenDOT Implementation Plan was published in 2012 to outline MassDOT’s sustainability initiatives under the themes of air quality, energy consumption, material procurement, land management, transportation planning and design, waste management, and water resources. At the OM INVEST workshops, MassDOT used a combination of educational presentations, breakout sessions that included INVEST scoring and a discussion of sustainability best practices, reports on breakout sessions, and discussion and evaluation of priority sustainability initiatives developed by workshop participants. During the breakout sessions, facilitators guided participants through OM INVEST criteria to perform a self-evaluation of MassDOT sustainability best practices for highway operations. Introduce INVEST as a sustainability resource and evaluation tool. Highlight existing MassDOT operations and maintenance policies and procedures, including sustainability best practices. Use INVEST evaluation to identify gaps and opportunities to incorporate new sustainability best practices. Holding three separate OM workshops enabled MassDOT to compare responses among the districts. 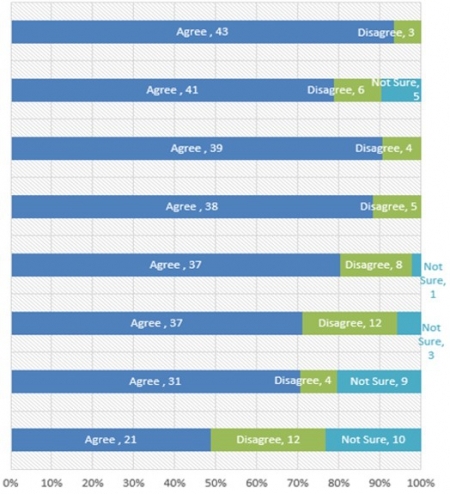 While the three groups agreed on the majority of their responses to the 27 different questions among the four OM categories, several responses stood out for their discrepancies. There were inconsistencies among responses about knowledge of whether a comprehensive sustainability plan exists, the level of involvement of sustainability committees and sustainability awareness, and follow-on monitoring and tracking of sustainability efforts. Additionally, the workshop for Districts 1 and 2 had different responses about electricity monitoring systems in OM-02 Electrical Energy Efficiency and Use, and the questions in OM-04 Recycle and Reuse. These discrepancies highlight areas where MassDOT can improve the consistency of its policies and communication around these topics. It also creates an opportunity to transfer the best practices of the districts that scored highly in these categories over to the districts that allocated lower scores. After the self-evaluation, workshop participants proposed new sustainability initiatives and identified eight priority initiatives for group evaluation. The participants discussed the associated costs and implementation challenges or opportunities for each initiative. Real-time polling software was used to enable attendees to anonymously participate in polling questions to gauge agreement on each initiative’s cost effectiveness and overall feasibility. Figures 1 through 3 below depict the priority initiatives and voting results from each of the three OM workshops. The figures list all of the priority initiatives submitted at each workshop and the total number of votes for cost-effectiveness, feasibility, and generation of co-benefits to reflect general agreement, disagreement, or uncertainty. This was followed by a group discussion of benefits and co-benefits of initiative implementation and additional comments. At the end of the OM INVEST Workshops, participants completed a written survey to gather feedback about their role at MassDOT, feedback about INVEST, sustainability, and the workshop. 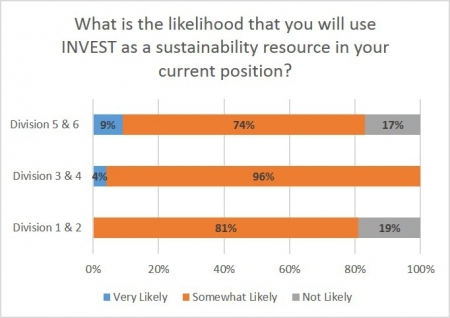 Respondents were asked to indicate the likelihood that they will use INVEST as a sustainability resource in their current position. The responses are shown in the Figure 4, below. MassDOT is using the information gained from the INVEST OM workshops to evaluate opportunities for improving the sustainability of MassDOT operations and maintenance. Priority initiatives resulting from the workshops are being further evaluated for implementation. Some of the lessons from these sessions apply across all six MassDOT districts, while others apply most strongly to particular districts. MassDOT evaluated the sustainability of its operations within the INVEST framework. MassDOT compared the sustainability of its operations statewide using a common framework. MassDOT generated ideas for new sustainability initiatives. MassDOT staff gained greater understanding of sustainability best practices and support for new sustainability initiatives. 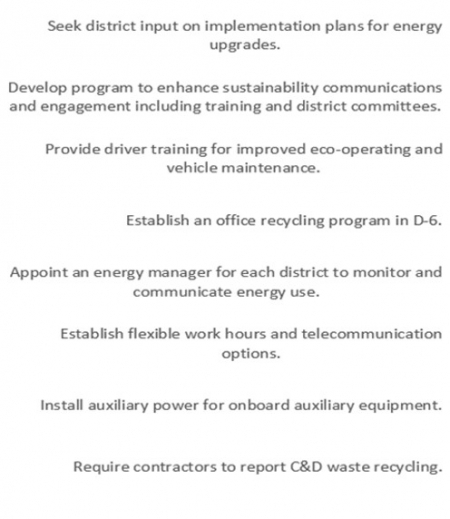 MassDOT is establishing sustainability teams to continue their focus on sustainability.